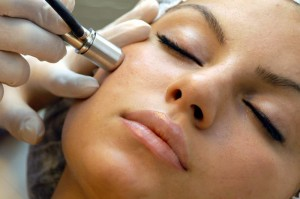 Microdermabrasion with diamond or diamond peeling uses sterile diamond heads, with varying degrees of abrasion to clean the surface layer of the skin, smoothing it, removing dead cells and impurities which are then sucked through a vacuum system in a special filter. This procedure removes skin debris, imperfections, unwanted traces of wounds and skin pigmentation, ameliorates the smooth wrinkles. Using this procedure followed by skin care products that penetrate so much easier the layer on its surface reaching the dermis, helps moisturizing skin , restores cell activity and restoration. After the procedure, the skin remains clean, shiny, smooth, healthy-looking. When to use this procedure ? How long? Is there a recovery time? The procedure is ideal for people who can not spend more time for complex procedures (surgery, laser).